Mali Mish - Airstream LA's Anniversary Camp out. We arrived on a Friday afternoon at the dealership. It is located in San Gabriel, CA which is just outside of downtown LA. The owner has been in the automobile dealership business for a long time and this is his first RV dealership. 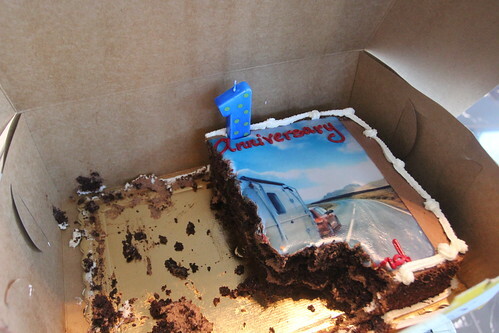 Since 2007, a noticeable number of RV dealers have gone out of business due to the economic downturn. 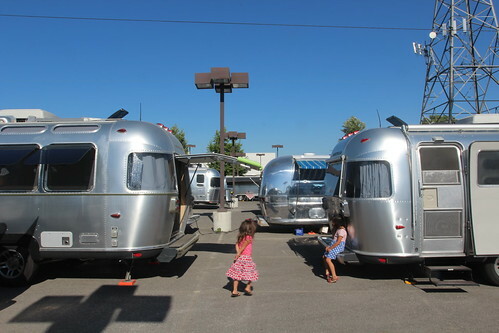 It is actually how we got a good deal on the Mish when the Airstream dealer went under in San Diego. We are happy to see that we now have one relatively close to our home base. We arrived to an already buzzing parking lot full of Airstreamers from the local WBCCI unit. We pulled up right behind an Eddie Bauer. 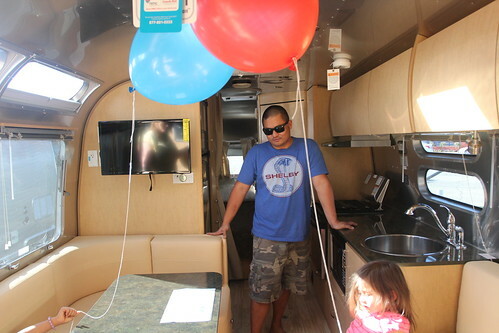 Part of our visit here is to check out the new Airstream 30FB Bunkhouse. We have been eyeballing it since its release last year. 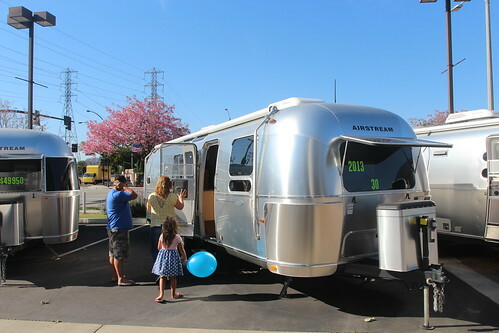 The folks at Airstream LA gladly gave us a tour of the new trailer. We were really looking forward to seeing our potential new home. We drooled over the full-time sleeping quarters for 5 as well as having a separate bedroom for us. However it was not perfect. Because of the layout, there are no wraparound windows on either end. Also the only trim available is the Flying Cloud version. We have really grown to love our Ocean Breeze interior and going away from it to any other feels like a downgrade for us. We would probably be willing to deal with both of those sacrifices but they did not offer that great of a trade in for ours. To pull the trigger on this bad boy we would have to chip in $8,000, jack up our payments by almost $300 a month plus resetting the loan term to an eternity of 20 years. Maybe we are crazy but even if they offered us a straight trade we would probably still need to sleep on it. We have never attended an event like this but that was the neat part of this visit. 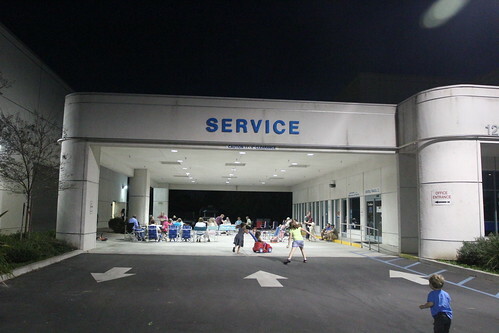 At night, we all gathered around the parking lot for a potluck. 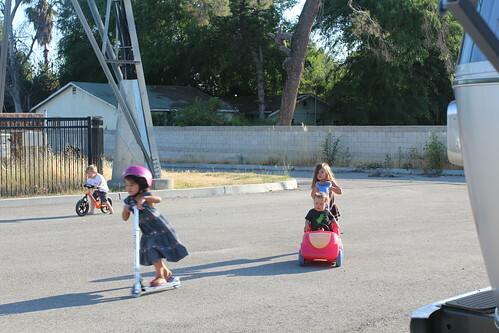 The kids scootered around while the adults consumed spirited beverages. On Saturday, we got a new neighbor. 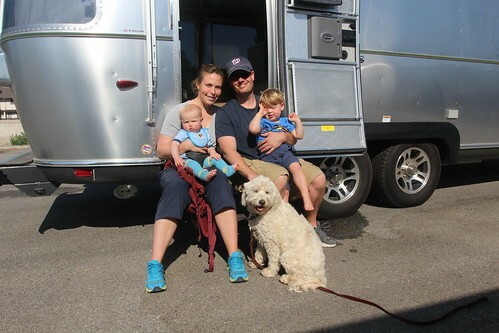 A family of 4 from Topanga Canyon, CA joined us in their 1-year old Eddie Bauer 25FB. 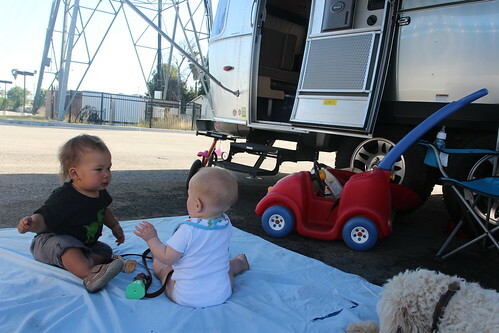 They have only had their trailer a short time but have been in love with them for a long time. Their 2 boys, Grady and Elliott, are adorable and super friendly. Elliott even handled playing with our our crazy toddler Luka with poise. Camping in an empty parking lot is second best to having a swimming pool as far as Ava is concerned. She can scooter around like a Mad Max without worrying about getting run over. 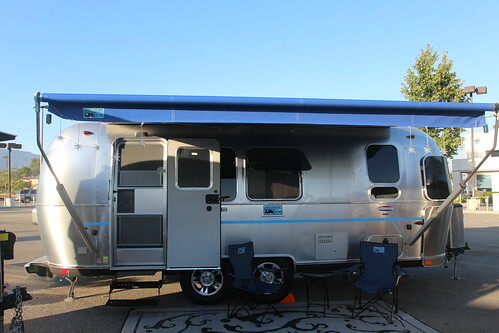 Our good friend Mona Heath from Oregon has been spending a lot of time here to build the LA branch of their new company Airstream2Go. If you have not heard about it, go check out their website. On our final night here, we got to have a cookout with everyone in the service bay. It was a very unique and fun experience to have done this and we hope to see most of the folks here in October when we make our way over to the Balloon Fiesta in Albuquerque. 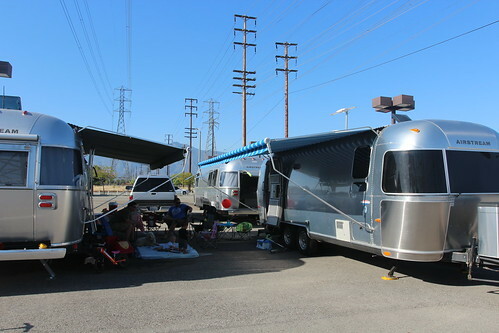 3 Responses to Airstream LA’s Anniversary Camp out. Dan, We continue to learn from you guys, especially when discussing various interiors. 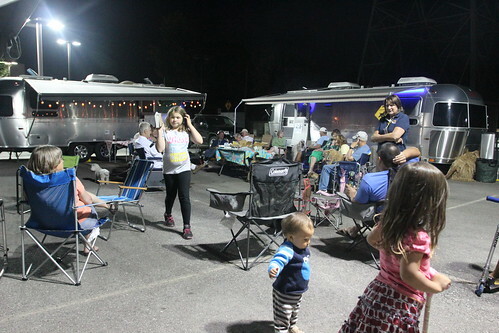 We still hope to ‘crash’ a local Airstream rally here in Michigan next weekend, if they’ll have us, to try to learn more, and think, and think, and think, and ponder, and ponder…. Dan, you captured the event perfectly in text and photos! It’s these fun, one-off, unique gatherings which truly bring out the Wally spirit! Looking forward to seeing you at the GREATEST hot air balloon event in the country! 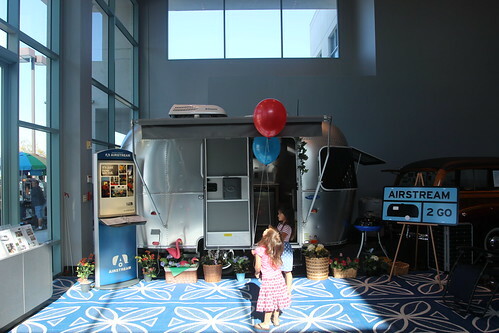 Interesting what you said about the 30FB…I like the idea of the bunks for the kids, but I felt like getting an airstream without any wrap around windows would be cheating ourselves of something that really makes an airstream an airstream. But since I don’t currently own one I don’t know if I’d miss having those windows or not although I’ve thought about it some.